1) Preheat the oven to 350 degrees. Spray a loaf pan (8½ by 4½) with cooking spray and set aside. 2)In a medium bowl whisk together the flour, baking powder, soda and salt. Set aside. 3) In another medium sized bowl, add sugar and lemon zest. Stir together. Add greek yogurt, milk, olive oil, vanilla, egg and egg whites, poppyseed and whisk vigorously until blended. 4)Add the flour mixture to the wet mixture and mix until just incorporated. 6) In a small bowl, mix 5 oz. Melanie’s MedleysBlueberry Cream cheese with one egg yolk. Pour over half of batter, spreading evenly into a layer but not mixing into batter. 8) Bake for 45-50 minutes or until toothpick entered in center comes out clean. 9) Remove and let cool to room temperature. 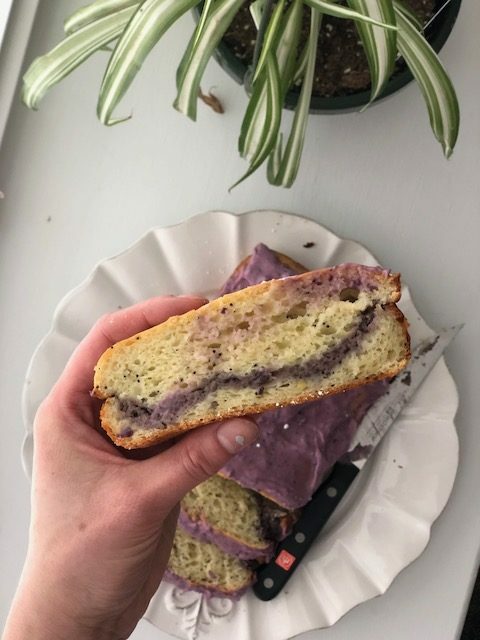 To make the blueberry glaze: In a small bowl, whisk together the remaining cream cheese, lemon juice, powdered sugar and add water, as needed, to thin. Pour over the top of the completely cooled pound cake.